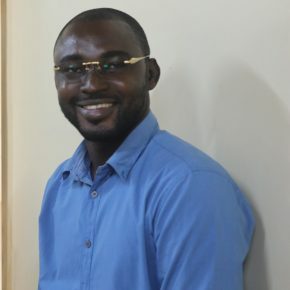 Peter Sheilo Baghr serves as the Digital Financial Services Coordinator in the WCF Ghana office, where he is responsible for coordinating the implementation and scaling up digital payment solutions across CocoaAction companies. Peter works closely with firms and other stakeholders in the digital financial services space to ensure financial services are brought closer to smallholder cocoa farmers to accelerate financial inclusion. Peter is an experienced development worker with over seven years of experience in the non-profit sector. Prior to joining WCF, he worked as a Business Services Officer on USAID-ADVANCE II project in the Northern Region of Ghana. He was responsible for leading the process of bringing digital financing services to out-grower businesses, smallholder farmers, and other actors along the rice, maize, and soy value chains. He has also worked with International Development Enterprise (iDE) as a Farm Business Advisor. Peter has also worked with the US Peace Corps as a Language and Cross-Cultural Facilitator. Peter has a Bachelor of Science Degree in Community Nutrition from the University for Development Studies and he is currently pursuing a Commonwealth Executive Masters in Business Administration at the Kwame Nkrumah University of Science and Technology.